An aging mid-size crossover that still has plenty of tricks up its pricey sleeve. I’ll bet you remember the first time you saw one of these. Even if it was in 2009, because that’s how long the Terrain has been with us. The massive square fenders and boxy lines that this made-in-Canada mid-sizer sports sure made an impression when this vehicle made its debut. While the exterior styling is getting tired, there’s nothing wrong with it and the packaging manages to make the Terrain look smaller than it really is. Did I mention those fenders? 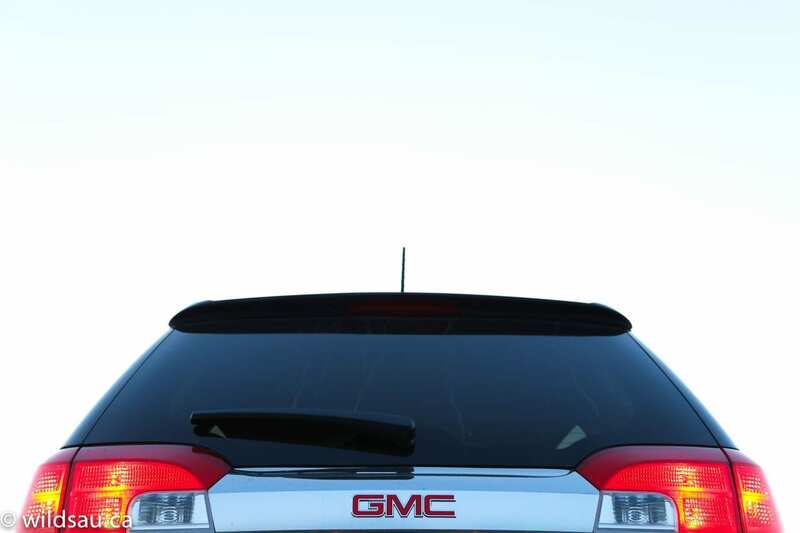 My sample was pretty showy thanks to contrast between the Dark Sapphire Blue paint and the chrome on the tailgate and lower rear fascia, the typical blingy GMC grille and the mirror-finish 18-inch rims. Overall, I think it’s still a pretty good looking vehicle and its truck-like design has aged quite gracefully. 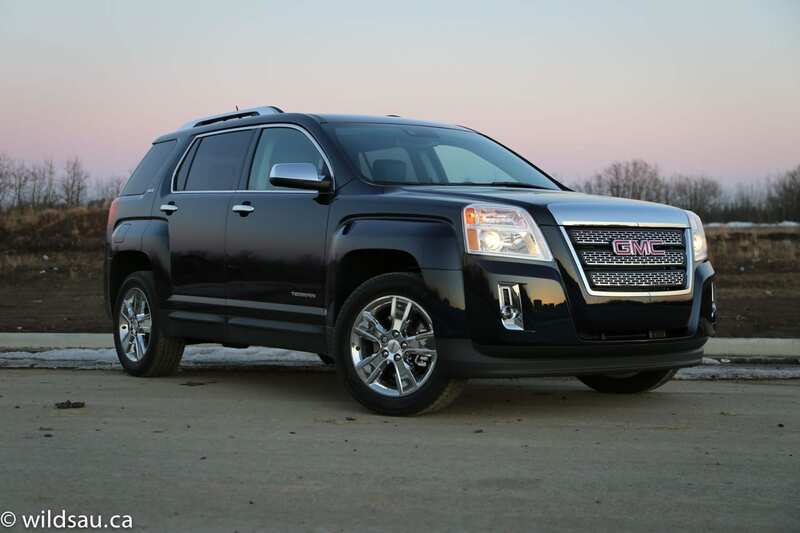 Inside, the dark and plasticky-feeling Terrain cabin is definitely showing its age. The plastics are hard, the textures are from a generation past. Fit and finish is reasonable, but I found some sharp edges and some of the joints (like the pieces of plastic around the ignition) are not very pretty. 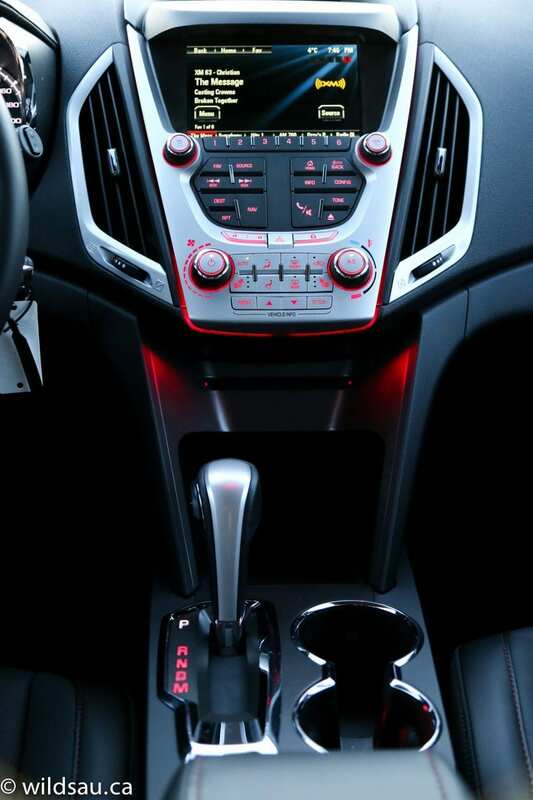 As you’d expect in a GMC, the cabin’s ambient lighting is red. 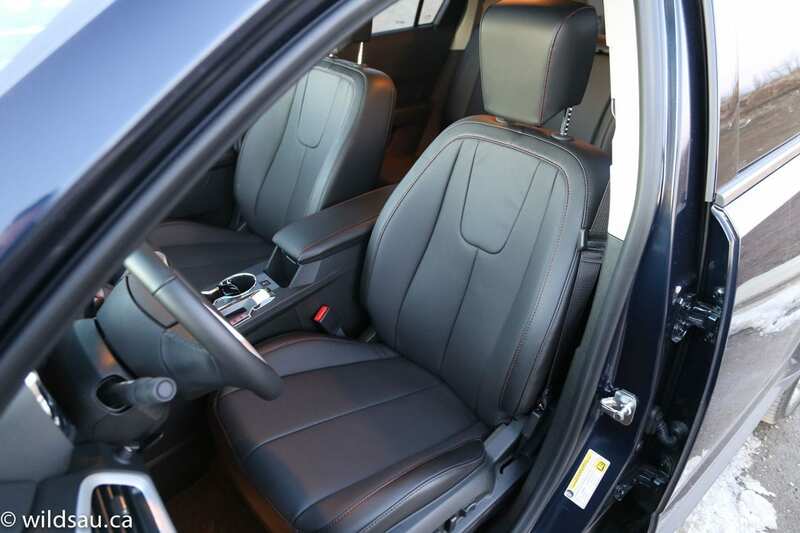 The heated leather seats are nice to look at and very comfortable. I found it strange that only the driver’s side is power-adjustable at this price point. 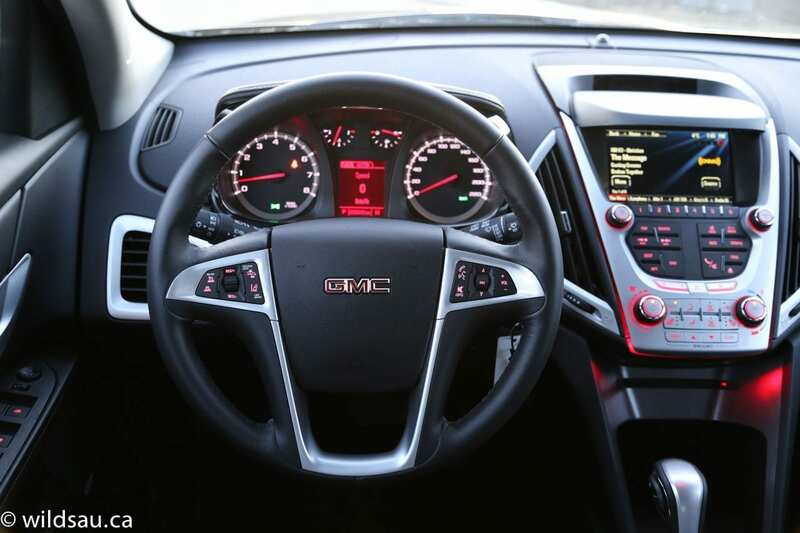 The big steering wheel has a ton of buttons on it, allowing you to deal with your audio, cruise control, phone and driver assistance tech. The gauges are nice and clean, making them easy to read, but GM is still sticking us with the crunchy, Commodore-64-graphics driver information screen. It’s really time to update those. 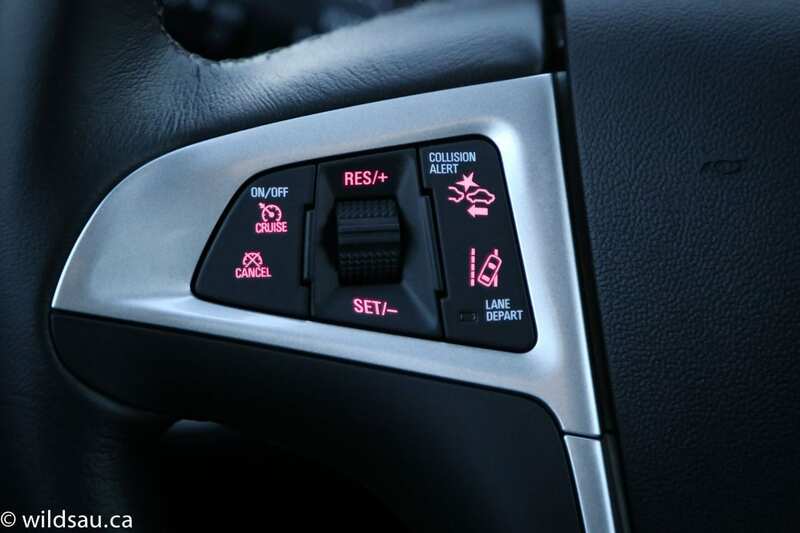 In the centre of the dash is a small strip containing the lights for the front-collision warning system – it flashes bright red and beeps loudly if you’re about to smoke into someone. 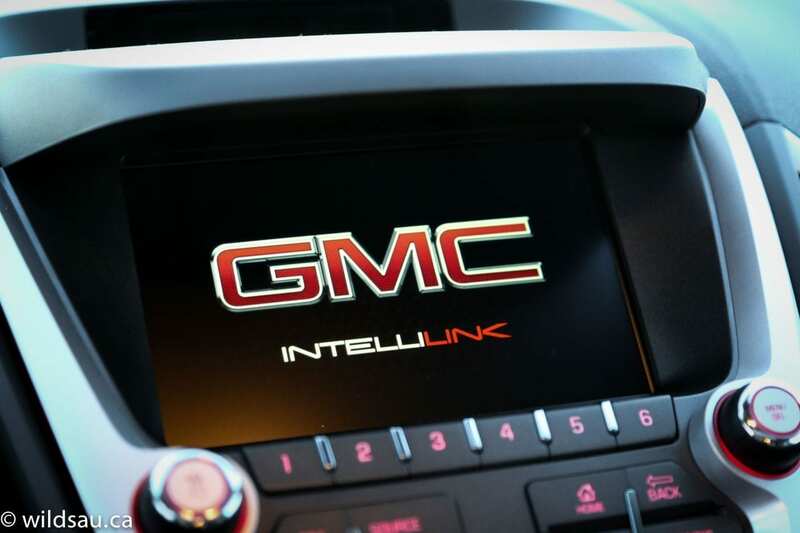 GMC’s IntelliLink system has a fairly friendly user interface and is based on a touch screen. I found the 7-inch screen to be a bit on the smallish side and I also found it to be quite a reach. 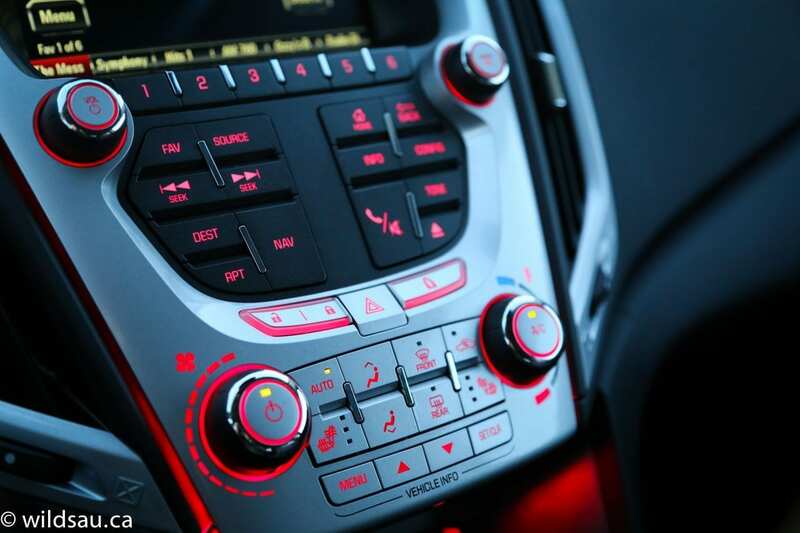 It handles the vehicle’s media, phone and navigation systems, as well as plenty of settings. 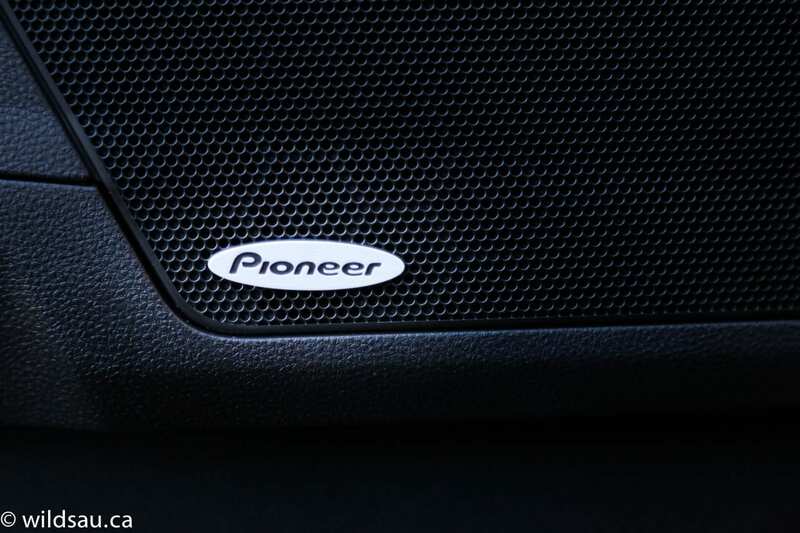 I thought the Pioneer sound system was decent, but not great. A big shout-out to the voice recognition system – it’s the best one I’ve ever used. It was 100% accurate and reacted within a split second of me speaking. Very impressive and definitely something other car manufacturers could learn from. The dash styling is fine, and the ergonomics are decent, although the hard buttons on the centre stack feel cramped. Overhead is a standard-size powered tilt/slide sunroof. 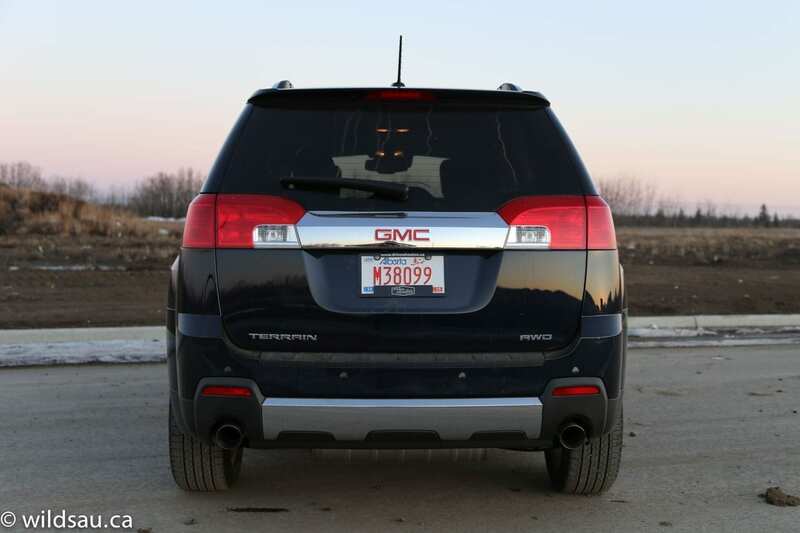 The Terrain has some sweet driver assistance technology in this trim – forward collision alert, lane departure assist and a backup camera with rear parking sensors. One of the biggest surprises was the space in the rear passenger area. Leg room is incredibly generous, as is the head room. 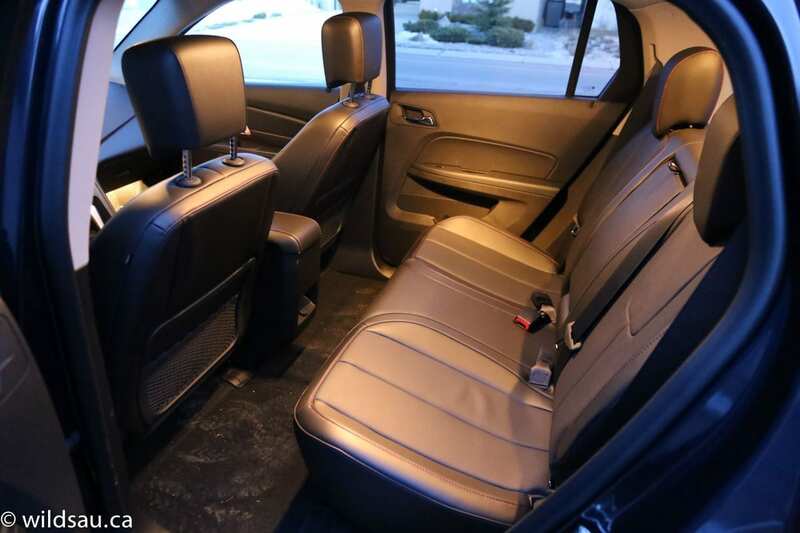 There is further utility and flexibility thanks to the reclining seats that can also slide fore and aft a total of 7.9 inches! 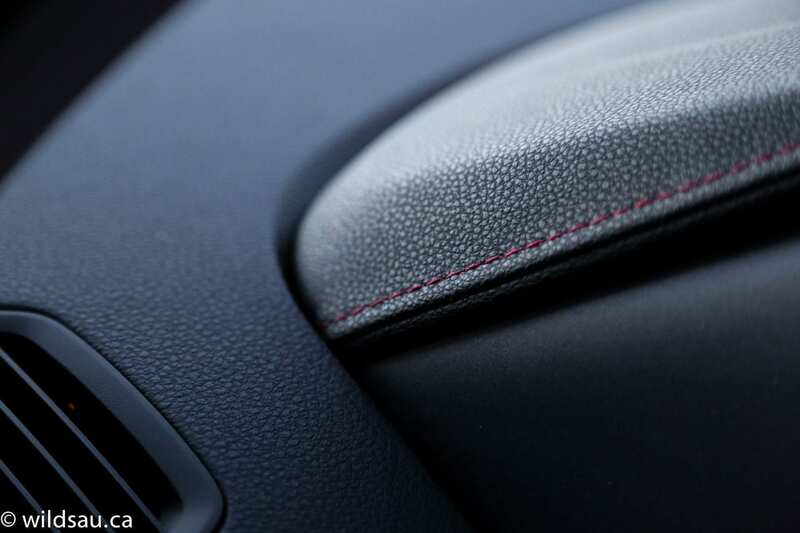 This allows you to configure that rear seating in a number of ways, and when they’re moved all the way forward (which still leaves plenty of leg room), it has a measurable impact on your trunk space as well. The seats themselves are quite comfortable, and thanks to a flat floor and a reasonably sized middle position, will accommodate three adults. My three kids were very happy back there, and if you’re putting child seats in your vehicle, you get two sets of LATCH anchors. 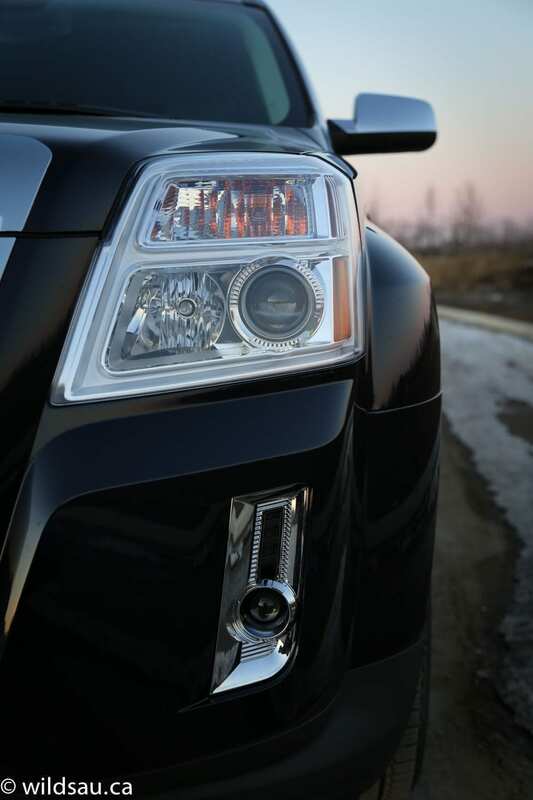 Speaking of trunk space, you’ll find plenty of it when you pop the power lift gate – 895 litres to be exact. Of note, this is less than some of the competition offers. 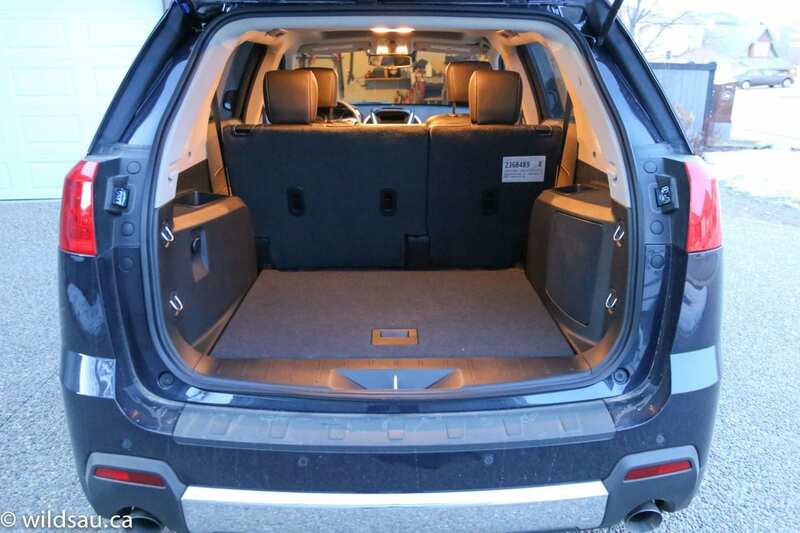 The load floor is at a nice comfortable height, and the rear seats fold down in a 60/40 split to give you a total of 1809 litres if you need it. A 12V plug is tucked into one side. Under the floor? A spare tire. Remember those? Here is another one of the Terrain’s trump cards. 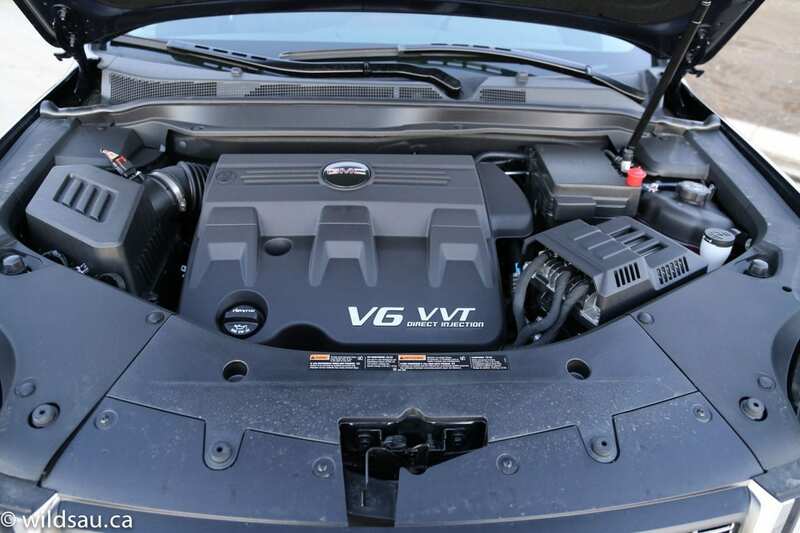 You can opt for a 3.6L direct-injection V6 that puts out a stonking 301 hp at 6500 RPM and 272 lb.ft of torque at 4800 RPM. The competition doesn’t offer this kind of jam. 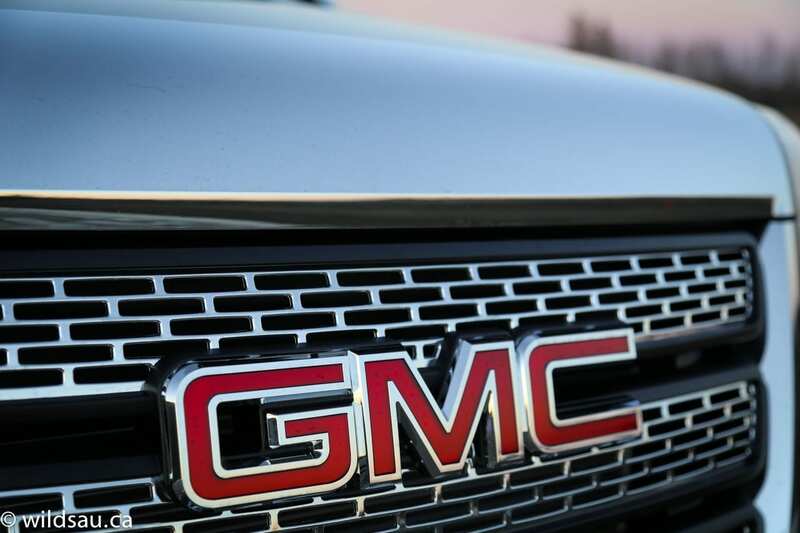 GMC pairs the V6 with a 6-speed automatic transmission and a full-time all-wheel drive system. 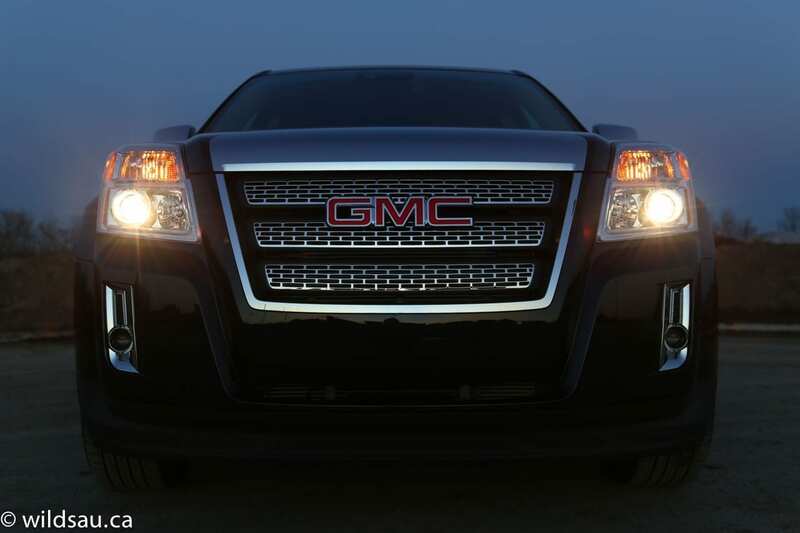 That kind of power doesn’t come free, especially when it’s pushing a crossover that weighs over 4000 pounds around. 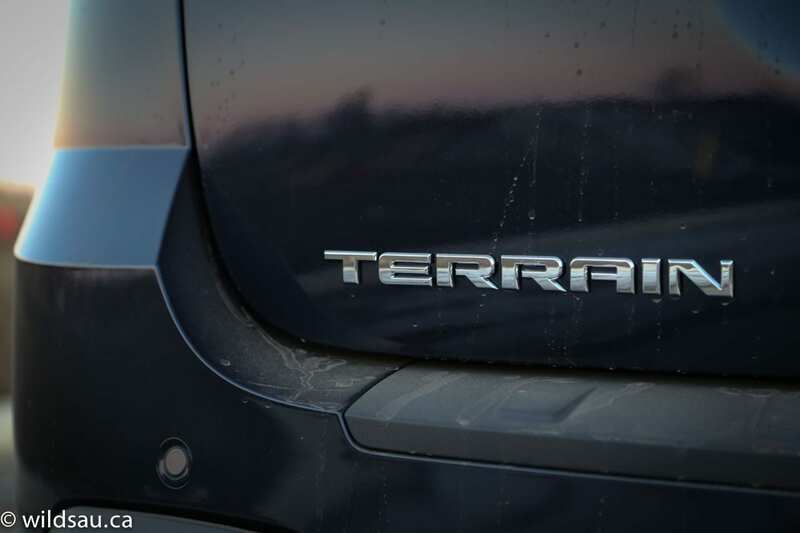 The Terrain is rated at 14.8 L/100 km (16 US mpg) in the city and a very unimpressive 9.9 L/100 km (24 US mpg) on the highway. We averaged an unsurprising 14.4 L/100 km (16 US mpg) during our week with it. 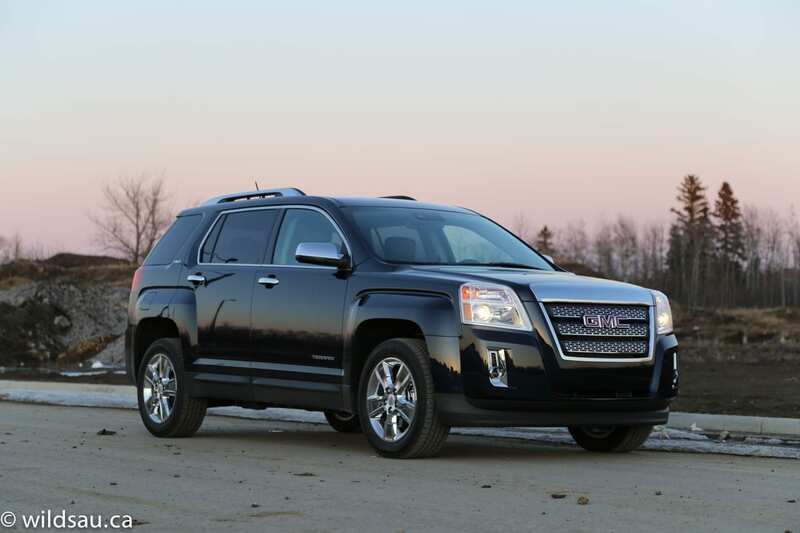 As you’d expect, the V6-powered Terrain has lot of power and it’s there immediately. No lag, no fuss. 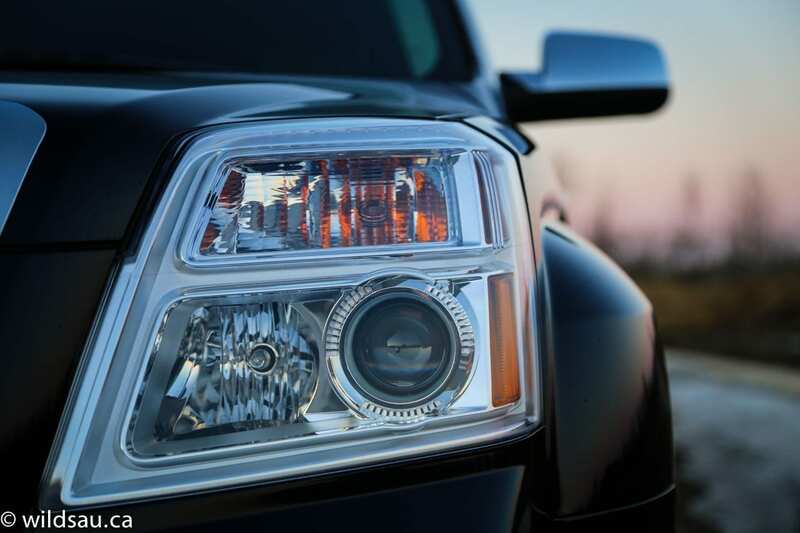 It hauls off the line, and you can access that power at any time. 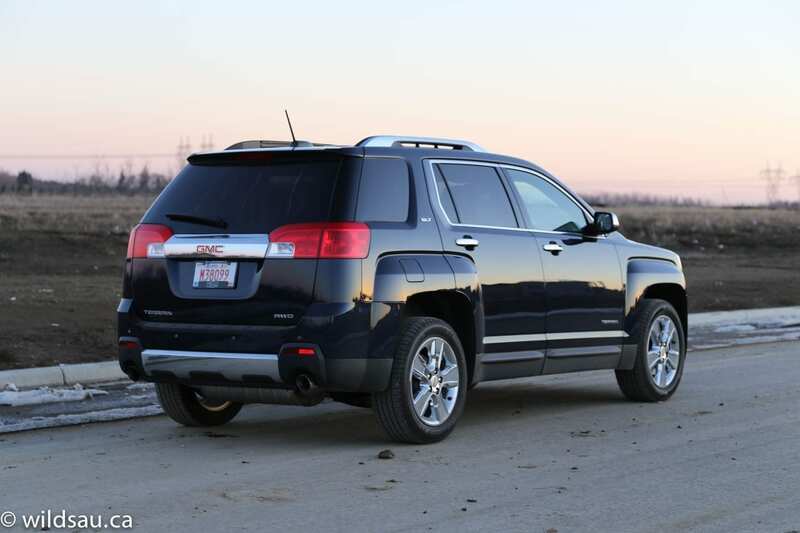 The transmission shifts smoothly and I was impressed by its willingness to downshift quickly. Gears can be shifted manually using the terrible thumb toggle on the gear selector. The all-wheel drive is effective, but I found that there was some graininess in the drivetrain, especially at lower speeds. Also, the vehicle has a terrible turning circle. 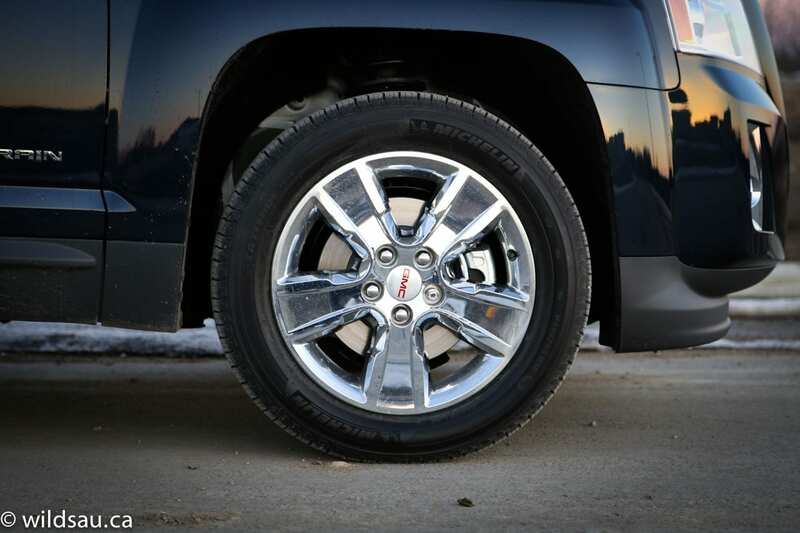 Reverse gear feels a bit sloppy, and it takes a real stab at the gas pedal for the vehicle to react – that imprecision is a bit unnerving when doing things like backing into a tight spot. 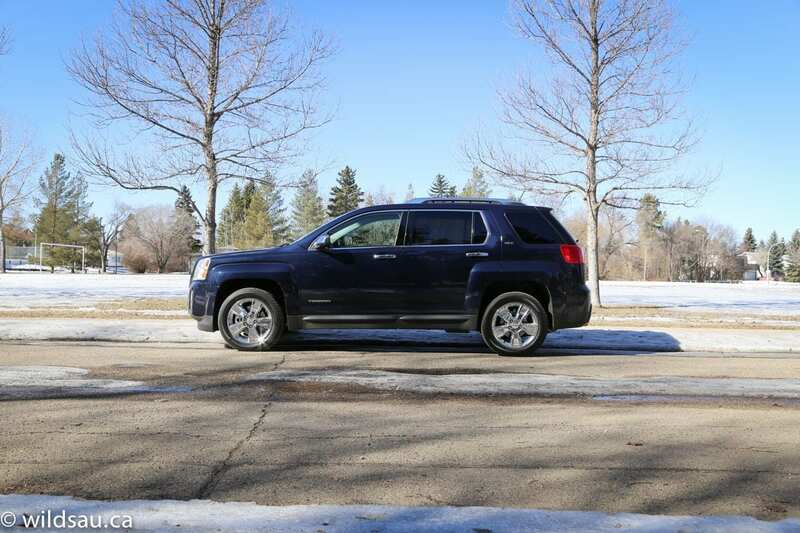 The Terrain’s ride, while quite pleasant on good streets (there are only two in Edmonton), abruptly changed its demeanour over bigger road irregularities. Potholes, cracks and series of expansion joints caused things to get a bit harsh. While it’s not sporty, I thought the Terrain’s handling was very good for a crossover. There was far less understeer than I expected, and even with the body leaning a bit, I was able to bite into corners and maintain some serious speed. The 235/55-sized rubber probably helps too. Visibility out of the relatively quiet cabin is acceptable. Brake feel is a bit mushy, but the binders are powerful enough when called upon. Oh, and all that power? 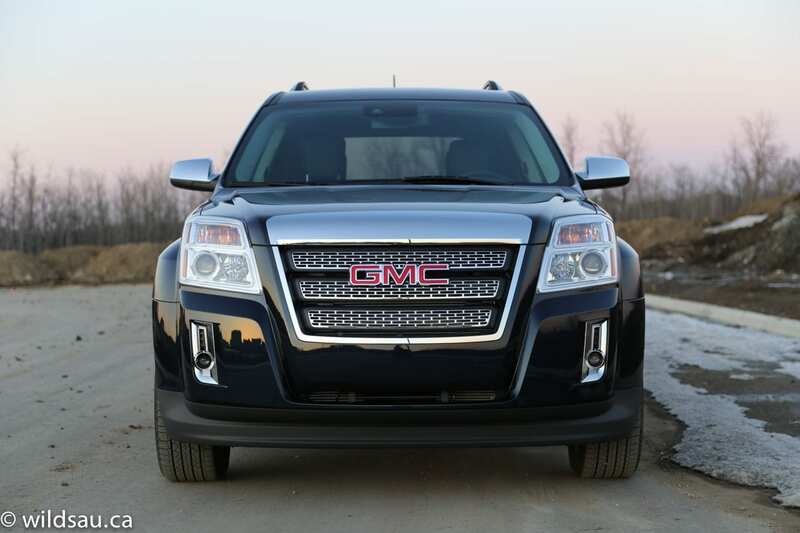 It also results in an impressive 3500 pound towing capacity. 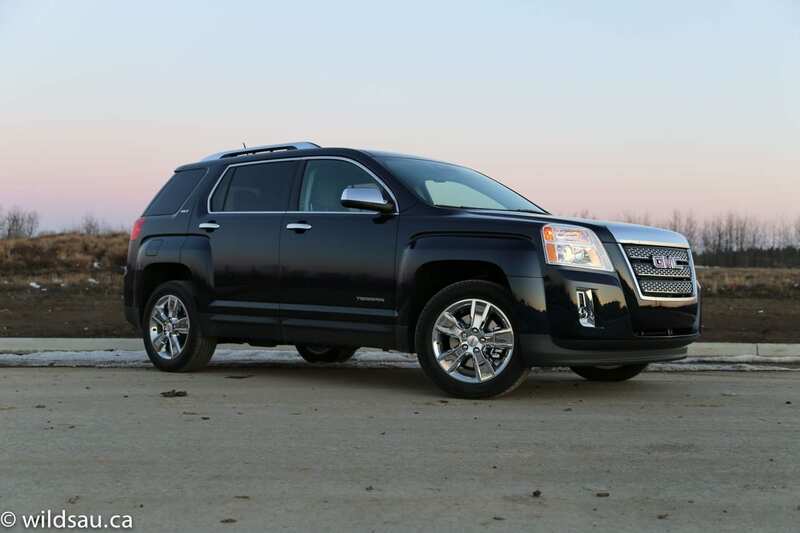 You can get into a Terrain for just under $25,000, which is pretty impressive – but then you won’t get it equipped like this one. The issue with this one is that it’s not the only player at this price. Yes, you do get a reasonable amount of equipment as well as plenty of power, space and utility. 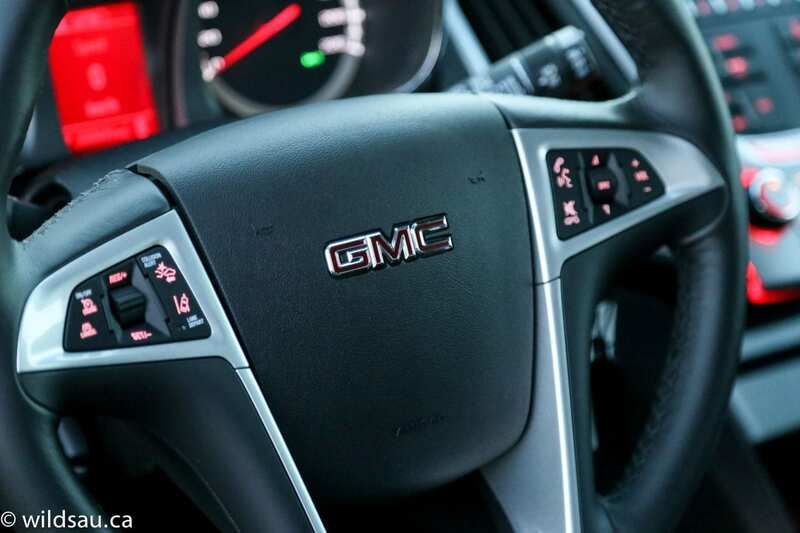 But there are a lot of players at the $43,000 level, and depending on what you want out of your vehicle, you might find that you can do better. 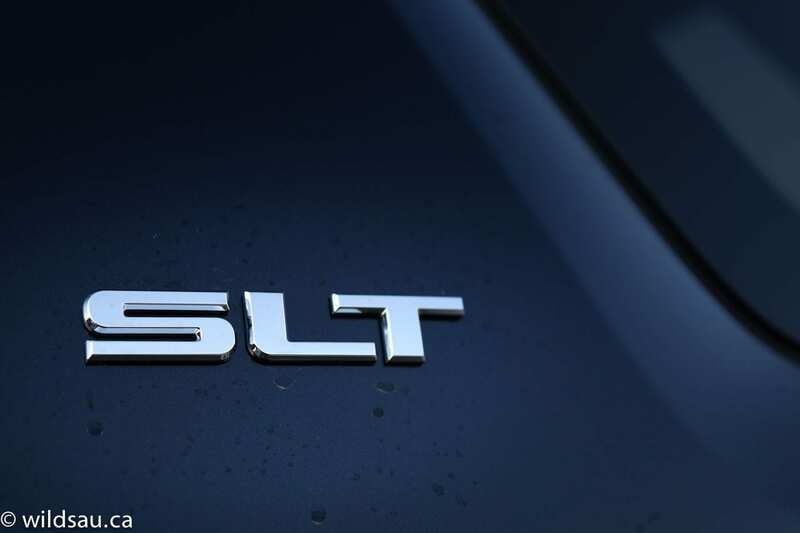 Granted, you won’t get that lusty 301hp V6 in any of the competition, and the fact that the Terrain straddles the compact and mid-size categories lets it compete with a whole bunch of other vehicles. WAF (Wife Acceptance Factor) was very high. She liked the driving position, the spaciousness inside and how easy it was to drive. On one hand, if you can live without the V6’s power, your $43,000 will buy you something much more efficient, modern and current. 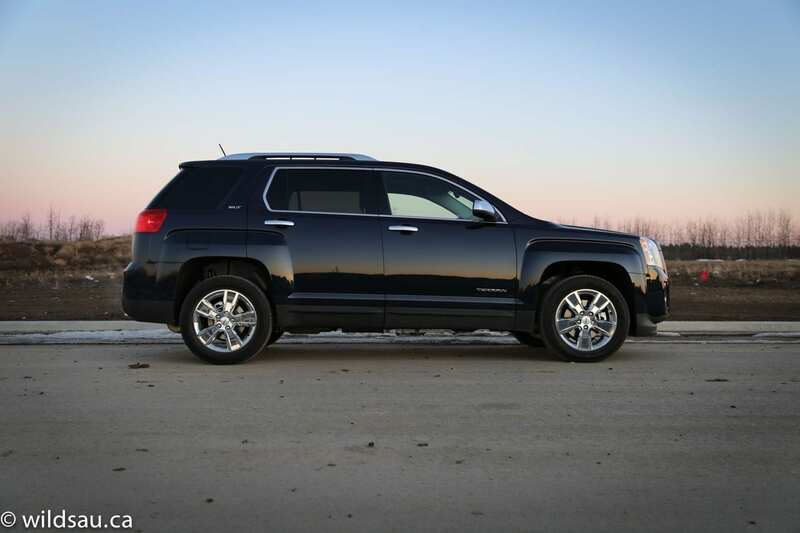 On the other hand, it’s a hot rod with this engine and it seems the Terrain’s styling still wins over a lot of folks. 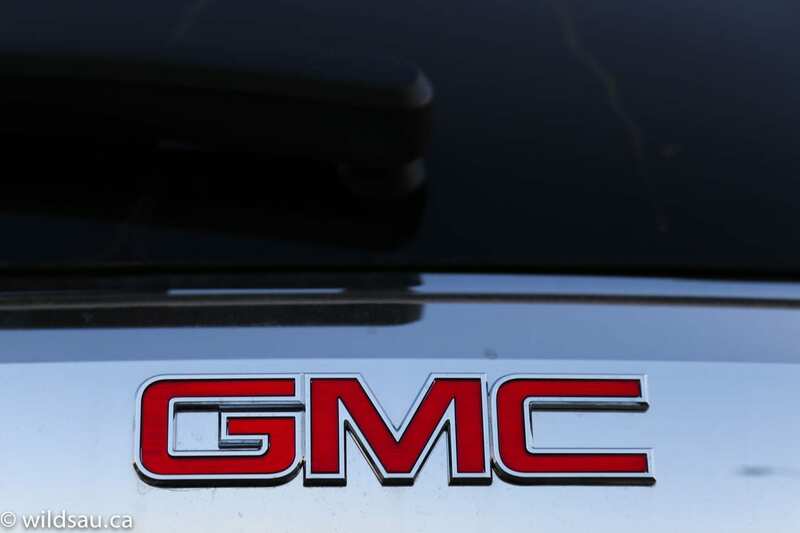 Hey, GMC sold over 116,000 of them in North America last year. Clearly the Terrain continues to be a compelling package for some buyers.